The induction ceremony for the South Dakota Tennis Hall of Fame is held at McKennan Park in Sioux Falls, a treasured setting for tennis in South Dakota. 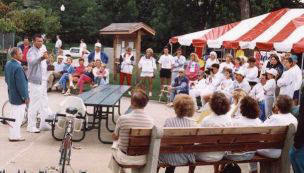 The event coincides with the final day of the South Dakota Adult Open, held in late July each year. Tennis enthusiasts who have attended the induction ceremonies are treated to a pre-ceremony Sunday Brunch, hosted by Spezia Restaurant of Sioux Falls. Traditionally, the ceremony begins at noon, and the honorees are introduced and have a chance to share stories and memories of their lives, as well as the impact that tennis has had on their lives. We invite you to join us for a day of tennis history, as well as a delicious breakfast, complimentary to all in attendance.